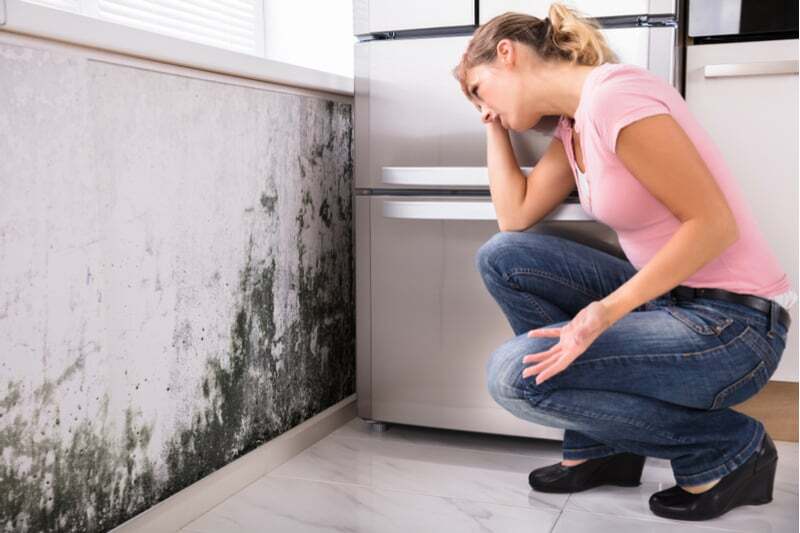 Molds are a class of naturally occurring fungi which thrive in warm, damp environments. As mold spreads, they slowly consume the surface they are growing on, breaking it down and spreading deeper into any suitable substrate. As these fungi reproduce, they disperse microscopic spores into the air. Mold spores are a serious public health danger. Many people are sensitive to spores as an allergen. Wheezing, puffy and irritated eyes, and skin rashes can all result from mold exposure. Even mild exposure can cause problems for most people. In an enclosed environment— like a bathroom or a basement—dangerous concentrations of mold spores can build in the air. Prolonged exposure to airborne mold spores can trigger severe reactions including fever and respiratory disorders. People with weak or compromised immune systems, including children, cancer patients, and the elderly, are at risk of developing much more serious fungal diseases from mold exposure. A rare subset of molds actually produce powerful mycotoxins. Acting similarly to heavy metal poisoning, even mild exposure to mycotoxins can cause health nightmares, and high levels of the toxin can cause seizures and death. The thought of being hospitalized by invisible mold spores is scary, but mold can also cause damage to the structure of your home. Mold will break down whatever surface it is growing on. Painted or lacquered finishes and decorative wood can be ruined, structural supports can be compromised, and extensive damage can spread unseen behind walls and under floors from just a single spore left in a humid environment. Mold can easily jump from a home’s walls to furniture and curtains, ruining them as well. If there is mold in my home, should I get it tested? There are services which will determine the presence of mold, and if present, the species of mold growing in your home for a fee. The Center for Disease Control and Prevention advises Americans that this is generally not necessary for mold found in a private residence. Problematic mold is plainly visible to the naked eye, so no tests are required to confirm its presence. Certain cases might require an identification of the mold strain to plan remediation, and remediation experts will advise whether they believe the mold should be tested. The bulk of diseases related to mold exposure are allergic immune system reactions. These are triggered by sensitive tissue’s exposure to microscopic spores, and the actual species of mold has no particular influence on the allergic response. Furthermore, there are no medical standards for an “acceptable” level of mold exposure, or an acceptable species of mold in the home. If mold is visible or can be smelled, it is a public health risk and the CDC strongly advises remediation regardless of what strain or concentration of mold is present. Green, white, red, black—does mold’s color matter? Nightly news scare stories and old wives tales like to push a dangerous myth: that a certain kind of mold is more deadly than the rest. They call it toxic black mold. This myth created a misunderstanding that only black molds present a serious health risk. This couldn’t be further from the truth. Most health risks from mold are an allergic response, and the human immune system doesn’t discriminate between green and black spores as they irritate skin and sensitive tissues like the eyes and lungs. Some rare molds do produce dangerous toxins, but they aren’t limited by color. A fuzzy white mold colony is just as likely to be a toxin-bearing variety as a slimy black one. Mold damages whatever it grows on. Door frames, carpet, drywall, and furniture can all be permanently damaged by a mold colony. Once mold appears, homeowners must act quickly to eliminate the problem or damage will quickly spread. Small outbreaks of mold can often be contained by killing the mold with an antifungal agent and scrubbing the mold away with a stiff bristled brush. Chlorine bleach is the most effective cleaning agent for mold, since it kills bacteria and fungus on contact. Even if professional remediation is needed for an extensive outbreak of mold, a quick treatment of bleach by the homeowner can be used to slow the growth of mold till professionals can step in. Scrubbing mold away with bleach might be an option for smaller problems like a moldy bathroom corner. Unfortunately, mold damage often works from the outside in. By the time mold is visible on interior walls, there is likely extensive damage hidden under the surface. Removing the mold and preventing a recurrence—a process known as mold remediation—is a difficult service requiring a specific skill set and tools. 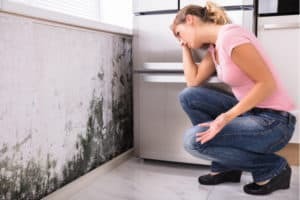 Mold is always a sign of water problems. Properly drained and ventilated rooms, even bathrooms or basements, should not develop mold colonies. In basements, mold is often a result of poor drainage. 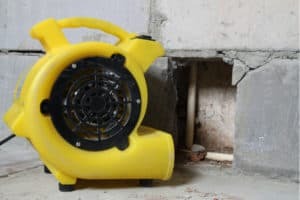 If water is penetrating the foundation and soaking into walls and flooring, mold can quickly develop in the dark, humid space between walls or under carpets. Leaking pipes or damaged roofing can also lead to extensive mold problems. By the time this mold is visible on the surface, extensive damage may have occurred behind it. So any remediation company you choose should be more than capable of killing the mold—they should have the tools and expertise to replace and repair damaged interiors as well. What do professional mold remediators do? Mold’s greatest danger comes from airborne spores, so professional mold remediators must take steps to prevent those spores from spreading and contamination the rest of a home as they clean the mold away. They must also find and fix whatever is letting water get into a dry space and causing mold to grow. The first step to limiting the damage caused by mold is by containing the spores in an already damaged area. To do this mold remediators set up special HEPA air filtration and plastic barriers between their work area and the rest of the home. Mold spores are small enough to fit through most home air filters, so a normal home HVAC system can’t stop mold from spreading. While working in the quarantine zone, mold remediators will don respirators and wear protective clothing to limit their exposure. If this sounds like overkill, remember that certain strains of mold can be highly toxic. Mold is a symptom of water problems, and the source must be found before mold can be removed for good. Sometimes the water problem is obvious, like a leaking pipe or burned-out sump pump. Other times, the issue can be poor drainage, and a French drain or sump pump installation must occur to prevent water from ruining the remediator’s work. Some things just can’t be saved. Ceiling tiles, insulation batting, paper products, and some furniture might be impossible to sanitize. The EPA recommends these materials be bagged and discarded with care. Flooring, drywall, and hardwood surfaces can often be cleaned and preserved. Dehumidifiers and fans can accelerate the drying process, while commercial disinfectant can kill lingering mold spores. Concrete block and masonry can usually be saved as well. The extent of mold damage will dictate how much repair work is needed. Calling professionals early in a mold infestation can limit the damage to some paint and trim work to reclaim a room from mold. Severe, lingering mold might require whole walls and ceilings to be replaced. If you are facing mold problems in New York, New Jersey, or Pennsylvania, ask the experts at Dry Basement Solutions for a consultation. With over 25 years of experience in the remediation industry, the family owned and operated team is ready to tackle your mold and basement water damage needs. Visit their website or call 609-647-4555 to schedule a consultation.